Produced fighters for the RAF, including the Gladiator, Meteor and Javelin. It also produced the Hawker Typhoon and Hawker Hurricane for the parent company Hawker Siddeley. The 1935 merger of Hawker Aircraft saw Gloster become a part of Hawker Siddeley Aircraft, Ltd.
Gloster produced the first British production jet fighter, the Meteor, the only Allied jet aircraft to see service in World War II. Eight squadrons were still flying this biplane at the outbreak of war. They saw combat in France, Norway, Malta, Egypt, North Africa, Greece and Iraq. The Gloster Gladiator was the last RAF biplane fighter and the first with an enclosed cockpit. The Gladiator was developed from it's predecessor the Gauntlet as a private venture by the Gloster aircraft company and was first flown on September 12th 1934. Perhaps the most famous exploit of the Gladiator happened at the height of the war; in the Mediterranean. The Gladiator… a product of a bygone era combining with modernity for one last fling… but it still had what it took to make a significant impact on history. The situation was desperate: British forces had been driven from Greece and Crete; they now rested at Gibraltar. Royal Navy forces under Cunningham were pounding the Italian Navy. And a little island stood in the way of supplies to Rommel in North Africa: Malta. The Italians decided to wipe Malta off the face of the earth. 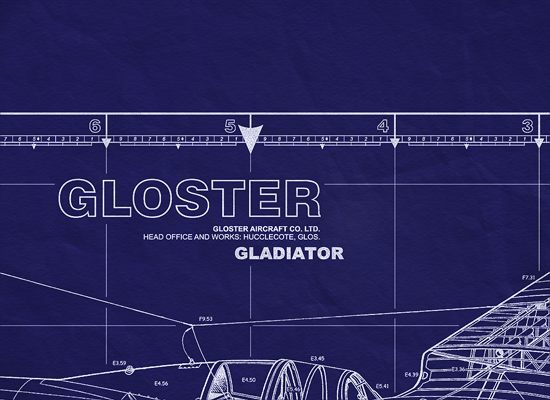 To defend itself, Malta had only the component pieces of five Gloster Gladiators. Two were lost on runway accidents. The remaining three, named Faith, Hope and Charity, successfully defended Malta against the entire might of the Regia Aeronautica. They took heavy toll on the Italians, and stopped only when Hurricanes arrived. Marking the end of the era of the single-seat fighter biplane in the R.A.F. Indeed, it was one of the last three warplanes of this type to see operational service, the others being the Fiat C.R.42 Falco and the Polikarpov I-153. The Gloster Gladiator enjoyed a distinguished wartime career. Most advanced British biplane fighter to serve with the RAF and FAA was the Gloster Gladiator which was flown as the Gloster SS.37 prototype on 12 September 1934. Entering service from February 1937 the RAF received 444 and the FAA 60 as Sea Gladiators before production ended in 1940. Only a few squadrons remained in service at the outbreak of the Second World War, but their classic exploits include operations from a frozen lake during the Norwegian campaign, participation in the surrender and capture of the Italian submarine Galileo Galilei on 18 June 1940, and the part played in the defense of Malta by the Sea Gladiators Faith, Hope and Charity. The Gladiator was largely replaced in front line service by the Hurricane and Spitfire at the outbreak of World War II, although two squadrons were used in the French and Norwegian campaigns. The Gladiator will probably be best remembered for the heroic defense of Malta by three Sea Gladiators, (Faith, Hope, and Charity) and their exploits in the western desert. 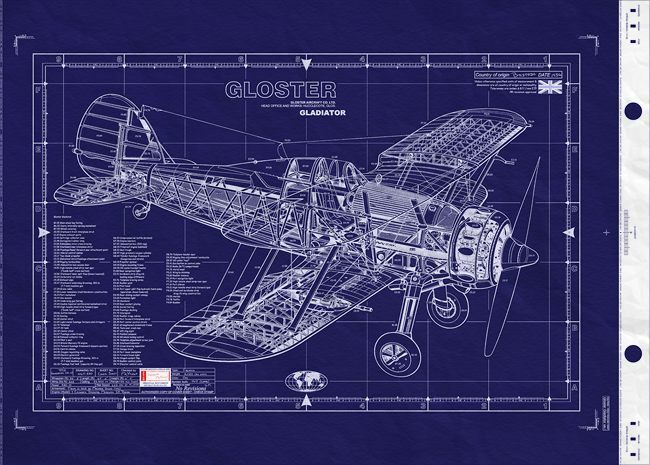 The Gloster Gladiator was a classic biplane fighter and was also one of Britain's biggest export successes before the war, seeing service in many other countries. In fact, it was already obsolescent when first delivered to the squadrons, and although it acquitted itself well, an unfair share of responsibility was vested in its pilots during those critical first years of World War 2. Dimensions: Span, 32 ft. 3 in. ; length, 27 ft. 5 in. ; height, 10 ft. 4 in. ; wing area, 323 sq. ft.
Armament: Two 0.303-in. Browning machine guns in the fuselage and firing through the airscrew disc, and two additional Browning guns mounted beneath the lower wing. Power Plant: One Bristol Mercury VIIIA or VIIIAS nine-cylinder radial air-cooled engine rated at 840 h.p. at 2,750 r.p.m. at 14,000 ft., and 825 h.p. at 2,650 r.p.m. at 13,000 ft. Maximum internal fuel capacity, 83 Imp. gal. (100 U.S. gal.). Weights: Empty, 3,745 lb. ; loaded, 4,790 lb. ; maximum, 5,420 lb. Performance: Maximum speed , 231 m.p.h. at 10,000 ft., 241 m.p.h. at 13,000 ft., 246 m.p.h. at 14,500 ft., 245.5 m.p.h. at 15,430 ft. ; maximum cruising speed , 212 m.p.h. at 15,500 ft. ; range , 410 mls. ; initial climb rate , 2,430 ft./min. ; maximum climb rate , 2,460 ft./min. at 6,500 ft. ; time to 3,000 ft., 1.3 min., to 5,000 ft., 2.1 min., to 10,000 ft., 4.1 min., to 15,000 ft., 6.5 min., to 20,000 ft., 9.7 min. 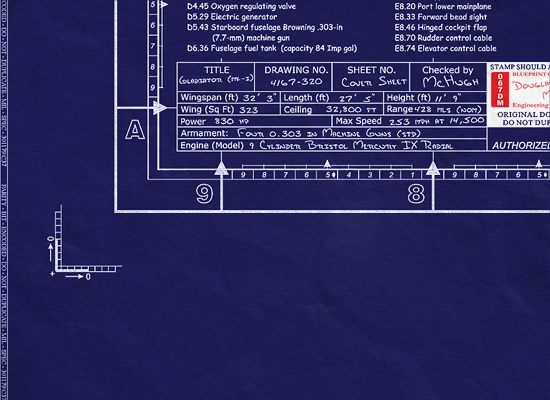 ; service ceiling , 32,900 ft. ; absolute ceiling , 33,800 ft.
Cockpit: The Gloster Gladiator became the first RAF fighter to feature an enclosed cockpit. The wing comprising two Hawker-type high-tensile steel spars with duralumin former ribs, the whole covered by fabric, and the fuselage was a rectangular-section tube structure with Warren-girder bracing in the side bays and faired to an oval section, skinning comprising detachable metal panels forward and fabric aft over a light metal structure in the form of hoops and stringers. The tail assembly was a fabric-covered, steel-tube and duralumin structure, and the tailplane was of variable-incidence type. 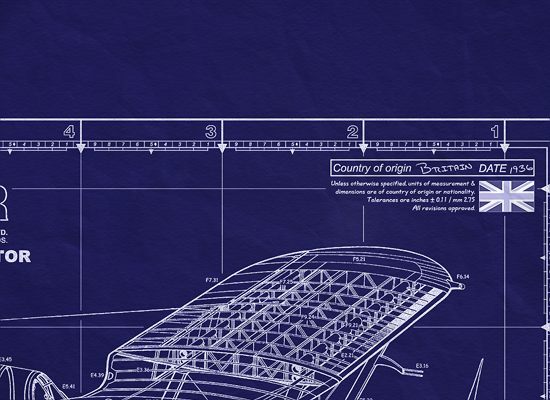 The wing center section was carried above the fuselage by splayed-out struts, and there was one pair of parallel struts on either side of the fuselage. An unusual feature of the production model was the introduction of small trailing-edge flaps on both upper and lower wings, these being operated by an hydraulic pump and serving to increase drag rather than lift, steepening the approach angle during landing. The sliding cockpit canopy first tested on the prototype was standardized, although this was greeted with some misgivings on the part of service pilots who, appreciative of the increased comfort, nevertheless considered it a potential menace to clear vision in combat. The Gloster Gladiator was the last biplane fighter built for use in the RAF but it served on many different war fronts until 1943 (it finished out the war as a trainer) It fought in many campaigns including Norway, Finland, Russia, Malta, North Africa, Greece, Egypt and France and even had a version designed for use by the Fleet air arm called the 'Sea Gladiator'. The Gloster Gladiator enjoyed the distinction of being the last biplane fighter to serve with the Royal Air. Force, and was perhaps the ultimate expression of the fighter design philosophy to emerge from World War I. The Gladiator was derived from the Gloster Gauntlet fighter, which it resembled quite closely apart from having an enclosed cockpit, improved undercarriage, considerably more powerful engine and single-bay rather than twin-bay wings. Produced as a private venture in 1934, the Gladiator was first ordered by the RAF in July 1935, when the new generation of monoplane fighters was already well under way. In the event the Gladiator proved a useful interim type, its high performance, flaps and enclosed cockpit making eventual transition to monoplanes easier. Some 23 were ordered in the first batch as Marks Is. Two months later the RAF ordered 186 Mark IIs with Bristol Mercury VIIIA radials in place of the earlier mark's Mercury IXs. The same engine powered the 60 Sea Gladiators for the Fleet Air Arm. Gladiator construction was completed in the spring of 1940. The Gladiator entered service with the RAF in January 1939 and the Sea Gladiator with the Fleet Air Arm in February. The Sea Gladiator had the addition of an arrestor hook, dinghy bay, and catapult points. Already obsolescent at the time of their introductions, the two types were phased quite rapidly out of front-line service. Gladiators served in France with the Advanced Air Striking Force (two squadrons). Others served in Norway, and one final squadron with RAF Fighter Command (No 247) fought in the Battle of Britain, defending the Plymouth area. Gladiators nonetheless enjoyed a longer and very useful career against the Italians in North Africa, Greece and in the early stages of the Malta campaign. The Gladiator was the favorite mount of Britain's highest scoring 'ace', M. St J. Pattle, who fought in North Africa and Greece. The Gladiator's top speed of 253 mph made it only slightly slower than the biplane Fiat CR42, which was capable of 267 mph. Span: 32 ft 3in. Length: 27 ft 5 in. Gross weight: 4,750 lb. Top speed: 253 mph. Armament: 4 x .303 cal Browning machine guns.